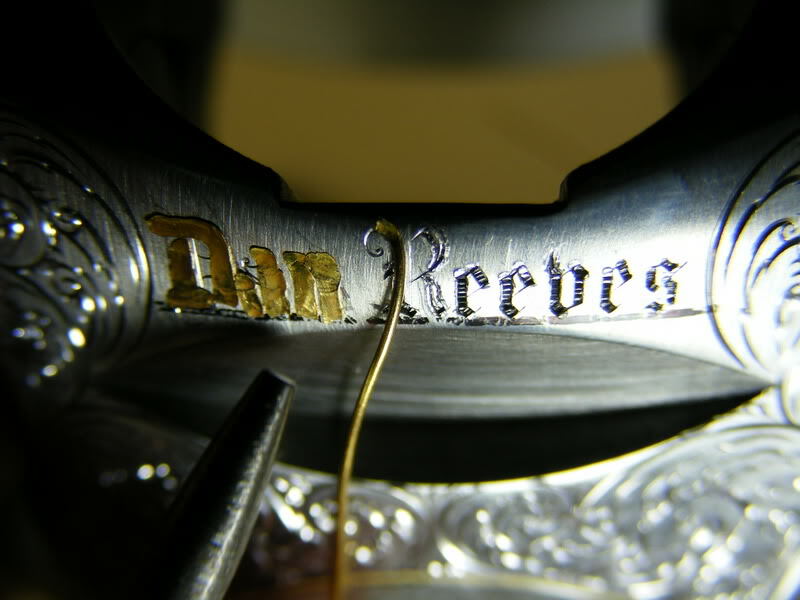 This is a partially completed piece of work for Dan Reeves. He was the Captain of Team America when they took the FITASC cup from the French, back in '86 if my memory serves me. He retired from competition years ago as a Wolrd Champion and now coaches sporting clays in LA. He coaches my daughter and I when we are down in that part of the world. 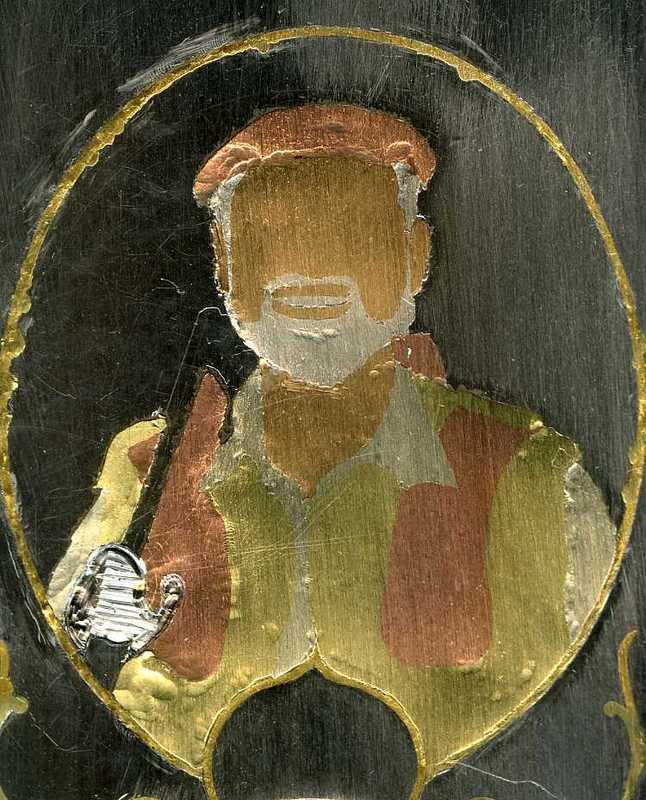 The gold is in, and the Bulino on Dan's portrait is started, but still has a long way to go. Wow. Another piece of art. I am so lucky to have the chance to see such beautiful works. Thanks. May I know what is the material of the brown hat? Is it copper inlay? It seems there are not only gold inlay but also brass, how you do that? Thanks Zernike, The hat and shooting pads and gunstock are copper. The flesh is a rose gold I mix up, and so are the two shades of green in the shirt. The beard is fine silver. barry the piece looks great:thumbsup::thumbsup: .is that a chain round the neck and a ring on the finger?how do you do the inlay in a inlay with metals of different hardness?.do you start with the hard metals and then the softer ones? hi Barry .. that is looking very good , i cant Waite to see the finished job .. thanks for showing .. ron p.
Barry, great looking inlay work. One question, what do you do to get the copper to be brown and how do you keep it that color? The copper inlays I have done in the past look more pinkish, I like this brown color better. Do you ever do anything that is not beautiful? I second the question on the copper. Have you applied a patina to it already or is this a case of how the camera picksup the metal. From here it looksto have an interesting mottled texture to it. Thanks Ron, Steve and Jacques, you have good eyes, I did not think anyone would see the ring, its Dan's World Champ ring, and yes that is a gold chain around his neck. I inlaid the copper first, then the white gold, green gold and silver and rose gold . here are pics of the intermediary stages. In the first I am excavating a cavity for the rose gold, the copper, white gold and green gold are already installed. 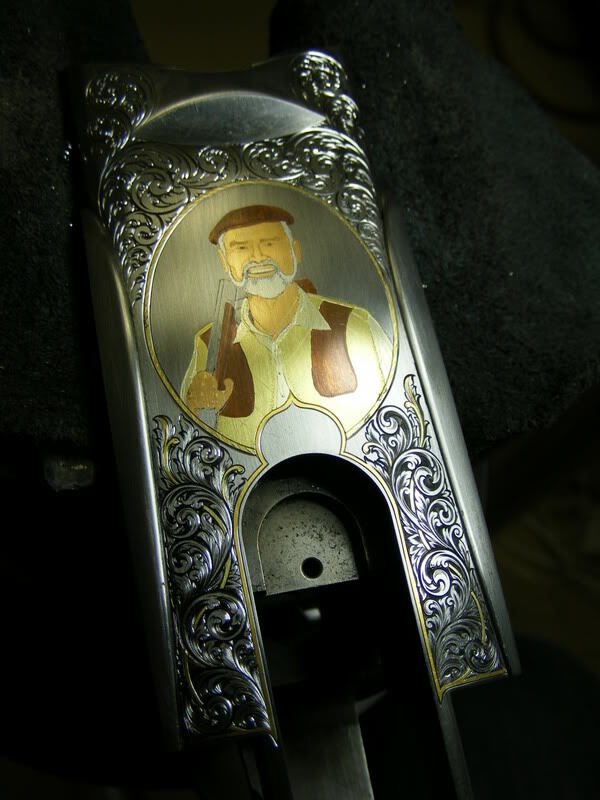 In the second pic the rose gold for face and neck are installed, all that is left is the rose gold for the hand on the shotgun. Brian and Steve, the copper naturally tarnishes from exposure to the oil on my fingers. Barry .. thanks for showing the gold inlay process in the workings , i get a lot of people thinking that when they see the finished product that is the way it started out . if i make any sense . ron p.
You are welcome Ron, Dave and Zern. 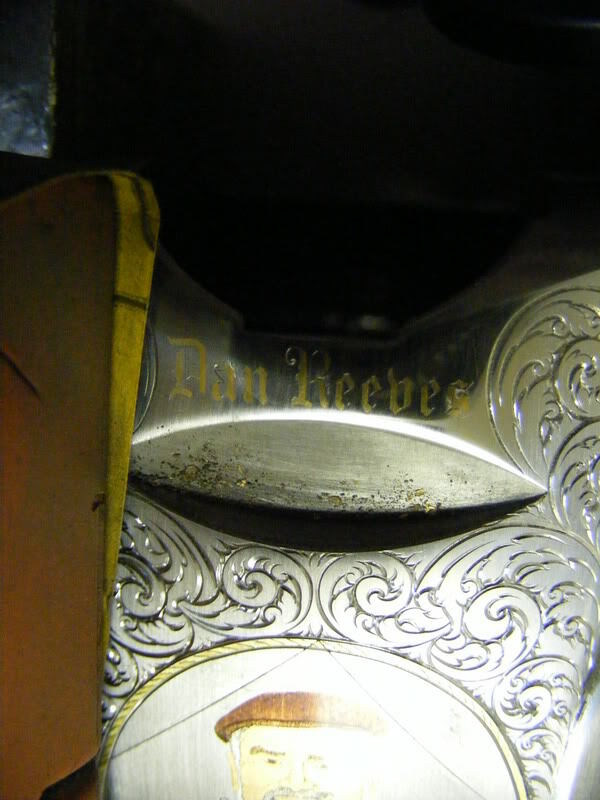 After transfering "Dan Reeves" onto the piece, I cut it in with a flat, and raised teeth in the background. I then cleaned up the corners and burnished lines straight with a scribe. Next I pound the gold wire in with a punch. 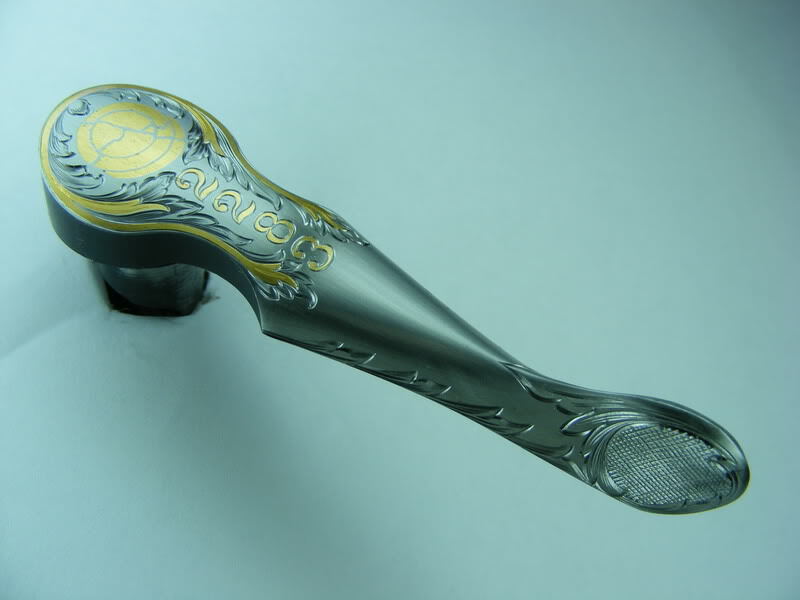 We are using the Artisan handpiece for this job. This is brilliant. I was wondering how you sanded the surface, and when you did it. How about the scrolls to the left and right of the portrait. 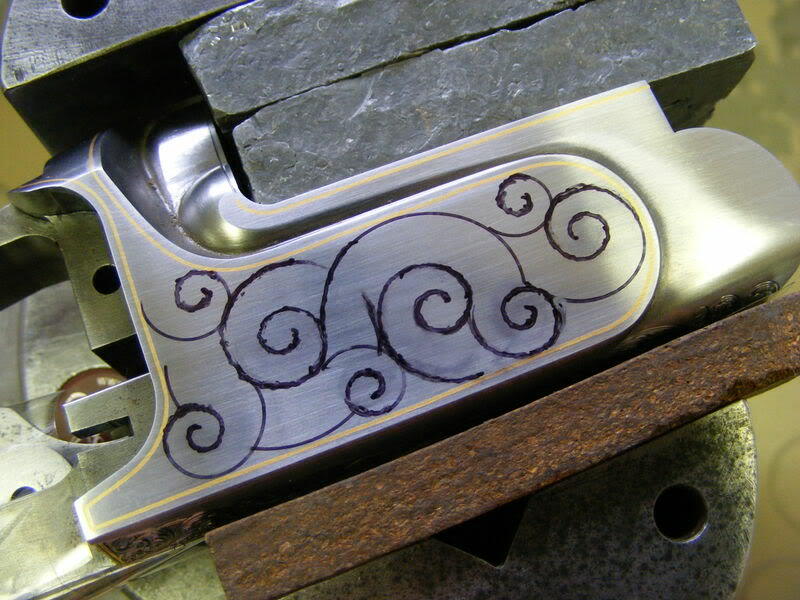 Do you inlay that gold stem first and then cut the scrolls? So you dont sand down the freshly cut scrolls. Thanks for showing. Nice clear pictures as well. Last edited by pkasnes; 08-10-2007 at 04:11 AM. Thankls Pal and Dale. When planned in advance, generally it is wise to do all the gold first. 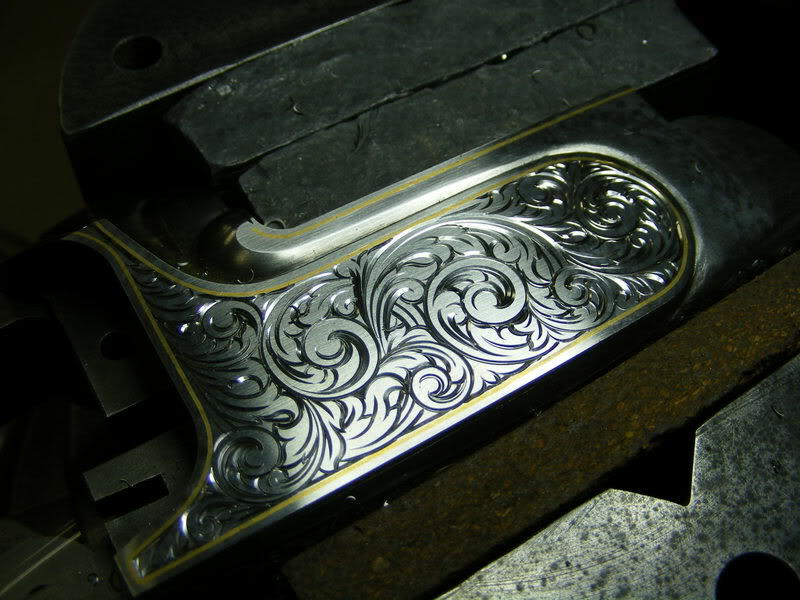 Quite often though I am more of a gestalt engraver, I have an idea at the beginning, but as I go along I adapt, and will add gold when I think I need some here or there.
" Be like the water, grasshopper... go around the obstacle, not against it". I noticed when observing Ken Hunt at work that he often finishes one small section of gold at a time, before moving on to the next. 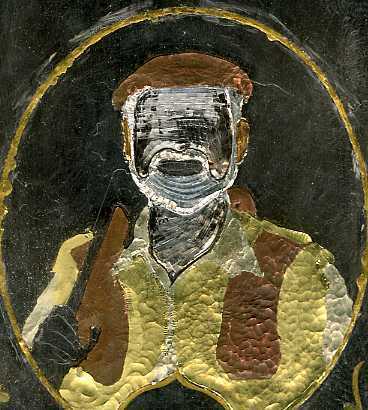 I have seen him use an engineers' scraper to remove excess gold after inlay. His technique allows him this luxury, of doing one bit at a time. Thanks again for the great work info and your time to contribute to this forum. This pic shows the scroll and inlay finished on the bottom. Most of the Bulino and the background behind the portrait still needs to be done, the image is very light and flat at this stage. The next step is to cover this with clear packing tape and work on the other surfaces, when everything else is finished, I will come back to the Bulino. 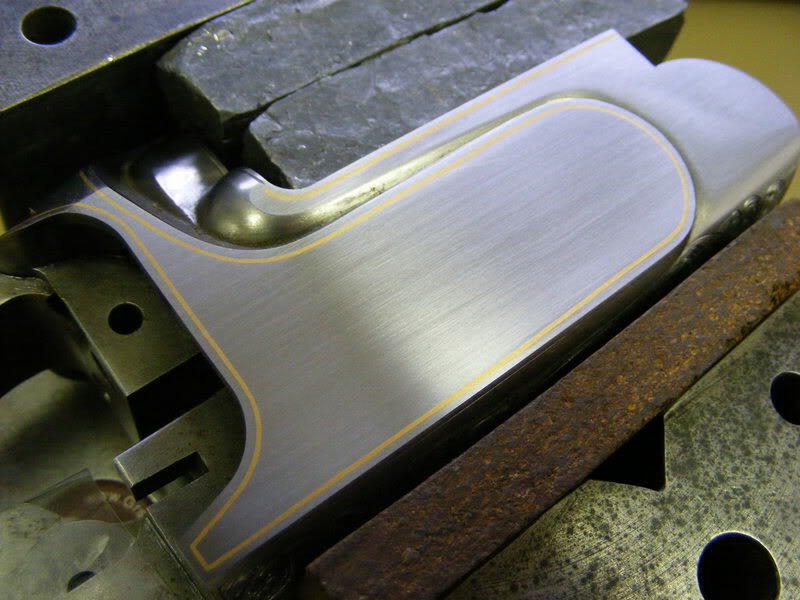 This way of proceeding allows less chance of damaging the finished work. 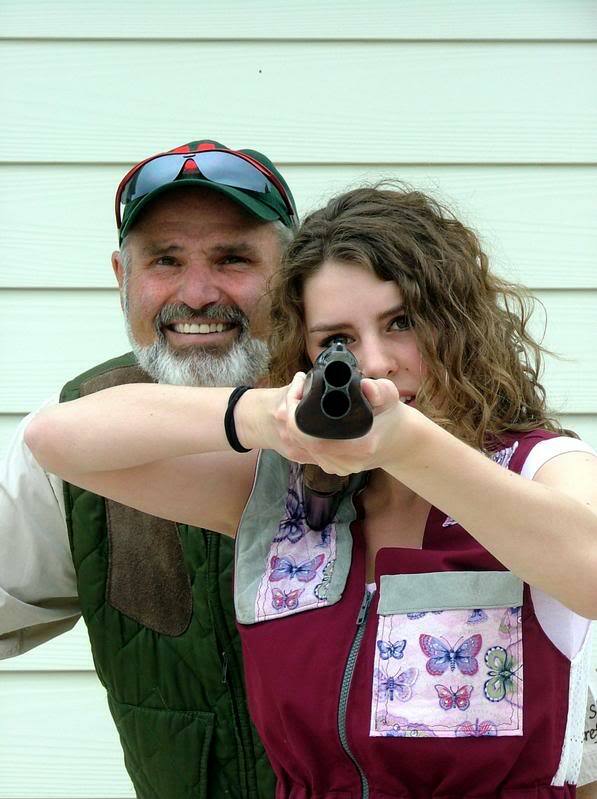 And here is a pic of Dan and my daughter Alyssa, so you can see what he really looks like. I was tired of wrestling with the action, so I cut the forend latch today. 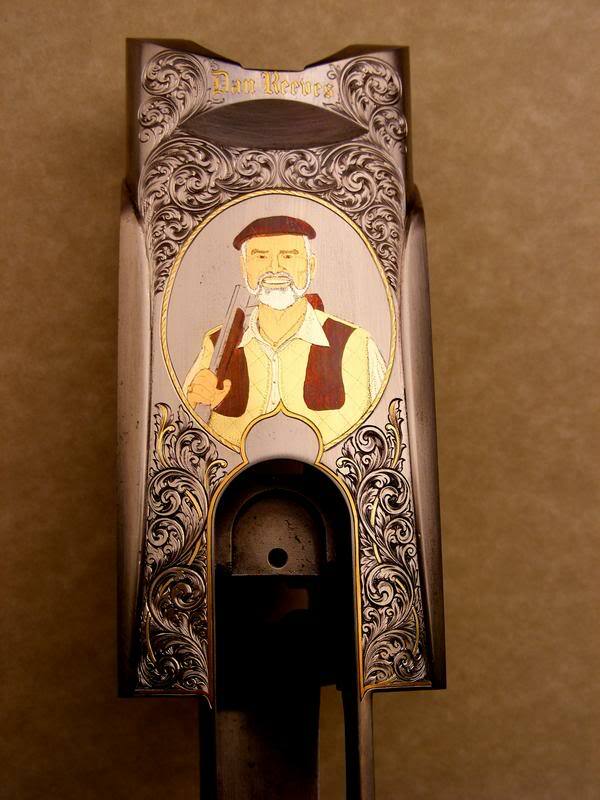 I will be in LA on the 25th of this month with this piece doing a demonstration at the "Shoot for the troops" at moore and moore sporting clays, it is a benefit for the wounded warrior project. If you are in the area, c'mon up. Today while Kulley is here learning my "flatgraver" gold line technique, I finished the toplever. It features a breaking clay and "2283" which is the number of clays Dan broke in one hour, SHOOTING FROM THE HIP, according to the Guinness book of world records. The way you highlight with gold is impressive. It doesn't overwhelm, it simply enhances... beautiful work, and very motivating. I need to continue my practice with inlays. Thank you. Thanks Dave, and Kurt. I just sort of winged it, not a lot of layout, just some scribbled lines with a Sharpie. "Gestalt" engraving you might call it. I like to have fun with my Art. When everything is right it feels just like when you were a kid, laying on the floor, coloring with crayons. Hi Barry, nice work! How many hours do you have in this gun? the coloured golds look great. 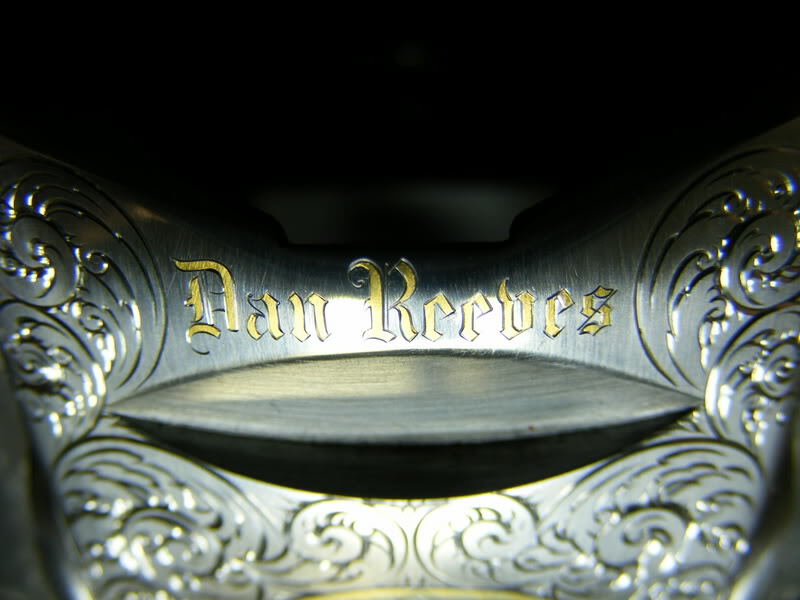 Don't forget to engrave the outside work leaf that's missing on the right hand scroll. I sent the Clapton guns back to Evans only to realise when looking at the photos later that day I'd missed a leaf out and left a gap! No one realised or said anything to me, luckily I sorted it before it went to the hardeners.....that would've been a disaster! I saw dad yesterday and he was showing me one of the multi coloured gold actions he'd done. It was back with him because something always seems to need fixing after it's been hardened. It was interesting how the colour case hardening process affected the gold alloys. The copper had gone a dark brown and the white gold was positively grey compared to the silver. He told me he often asks to see the actions after hardening so he can polish certain areas carefully to restore the colours. Interesting eh? I don't know how cyanide hardening/coin finishing would affect the various precious metal alloys. that would make an interesting experiment. Hi Marcus, Thank you for your insightful comments. I am glad the Clapton guns came out well, congratulations. That is quite a coup. As to the Perazzi, I have only a vague idea of how many hours are in it. The long part was deciding where to put what colours, how to mix them up and how to relate it to the scroll etc. Once I had the gold brought down flush I felt I was almost done, hehe. After the rest of the action is done I will cut a line around the figure and etch a sporting clays station behind Dan to give him some depth. and after that I will scratch at him a little more adding more dots and grey scale. yes, the effect of the hardening process on gold is a concern. This gun being a restock, does not need to be processed for hardness, so I will lacquer it to protect it and bake it on. 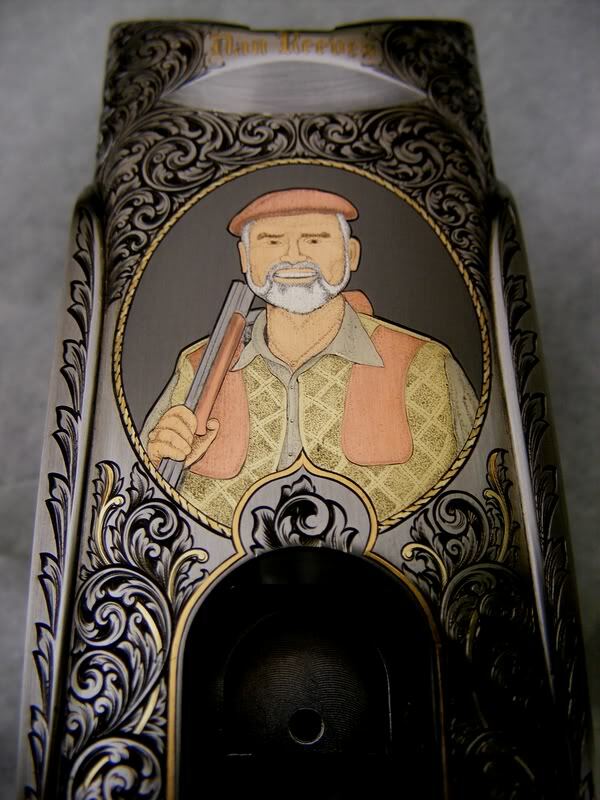 The copper is brown and in this case that is the proper colour for the cap and shooting pads, and gunstock. After reading your comment about the work leaf I pulled the action out to look for leaves that were unfinished and it looks like I shaded it after I took the pic, I certainly hope so, hehe. May I ask a question? What is the meaning of the term " work leaf"? Give me regards to your Dad and bride(and Mum). Sorry Barry, I meant the term to read 'outside work' and by this I mean any leaves, etc, that form onto the back of a scroll i.e. 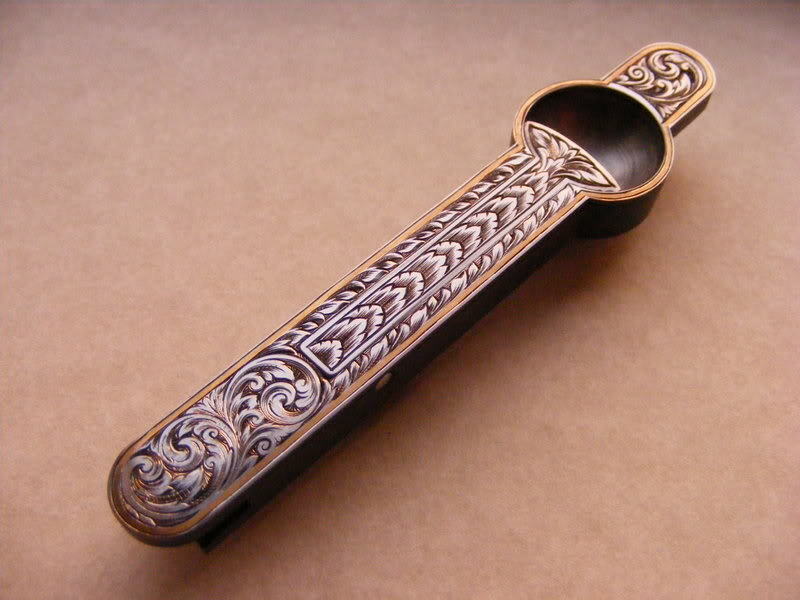 the filigree stuff that in itself isn't a scroll. Looking at the photo you have one of these leaves at the tip of the scroll on the left (under the portrait) but not the one on the right. I know this is WIP pic and you've probably since sorted it but it just looked a little odd; for some reason my eye was just drawn to the 'something missing' spot. I've done 2 Perazzi's in my time, one was fantastic to cut and the other an absolute pig. Marcus, Thanks for the heads up on the leaf, I looked at the job last night and sure enough, I had missed it completely! Today I am on my way to Japan, I am doing a Temple Tour, Spiritual retreat kind of thing this next week or so, and am at a netcafe in Honolulu at the moment. Hello Barry, I have been watching this work of art of yours since it was first posted awhile back. It looks fantastic! I like howyou have done the panel, it is very rich and elegant to look at. Quick question....is the background relieved or just angled cuts? I call that relieved fan cutting, it is a style of relief. It is made simply by cutting with a Lindsay patent point in a fan pattern radiating from a single point. That point is usually where the cap cut meets the scroll line or, where it meets the next leaf. It does remove all of the surface level material causing the scroll to stand out "in relief". So beautiful. Your works are always so impressed. Thanks for post the update photos. you are all very welcome. I am writing this on my new iPod touch, this thing is amazing. This is progress on the other side. Thanks for showing the progress. I have some question. I notice all your gold letters or gold lines both have an outline and this outline add dimensions to the gold lines and gold letters. For the letters, it is hold in place by the raised teeth, but for the outline, did you raise teeth at the middle of the line as well? Steve's turtorial telling that there is a undercut at both edge of the gold line so as to hold it, but if you cut the outline at both edge, the undercut will be cut away, how the gold line still can be held in position? How can we classifly this kind of gold line or letter, inlay or overlay? How you draw the scroll main line on the gun? I see some are very clean line but some are rather rough, why this happened? do you use a template/circle guide? Do you cut the leave "free-hand" without any drawing or design before? Hello Barry! That is awsome!!! Thanks Barry, everything is very clear to me now. 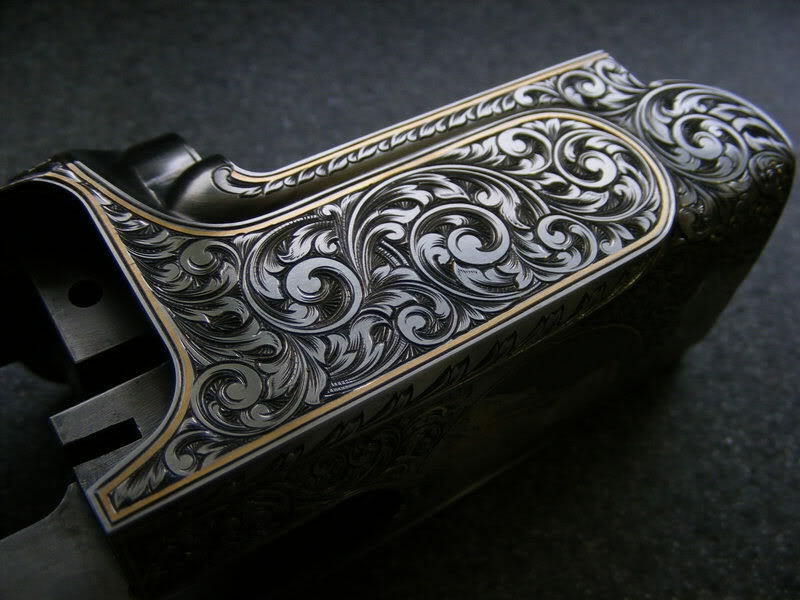 It is one of the World's Greatest Tutorial in Engraving. Thanks for everything you done. Zern, You are very observant and I can tell you are really thinking these things through. 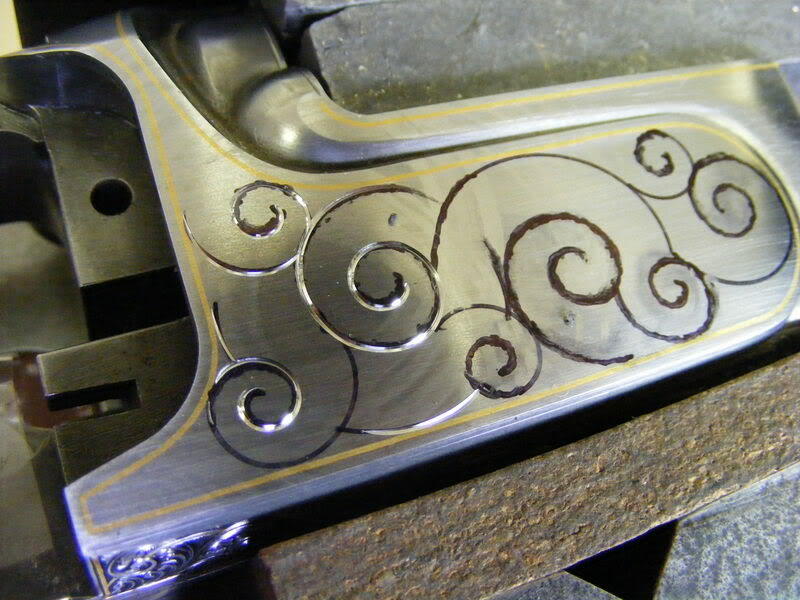 This Gun will be inked and laquered when finished, with no case color or blue. 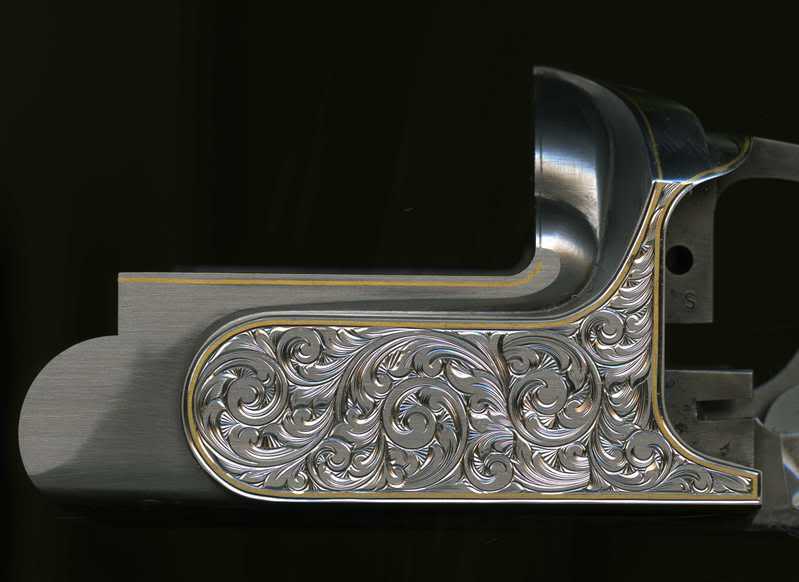 These guns are sent out by the factory fairly hard, so it will essentially have a "coin finish". 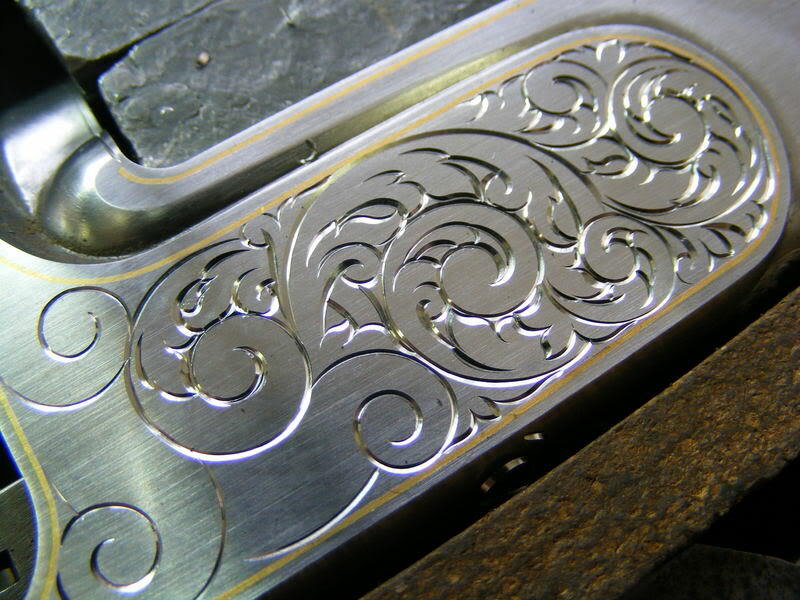 Because of that all the gold work needs a fine accent line cut along the edge, In the steel, to make it stand out. I dont cut the accent line deep enough to affect any undercut. Usually I don't inlay wire quite the way Steve does, I use a " Rolled Edge fastening ", a technique I developed on my own after many years of using the traditional "undercut fastening". I do put teeth in the bottom of the relieved cavity before I hammer in the Gold. 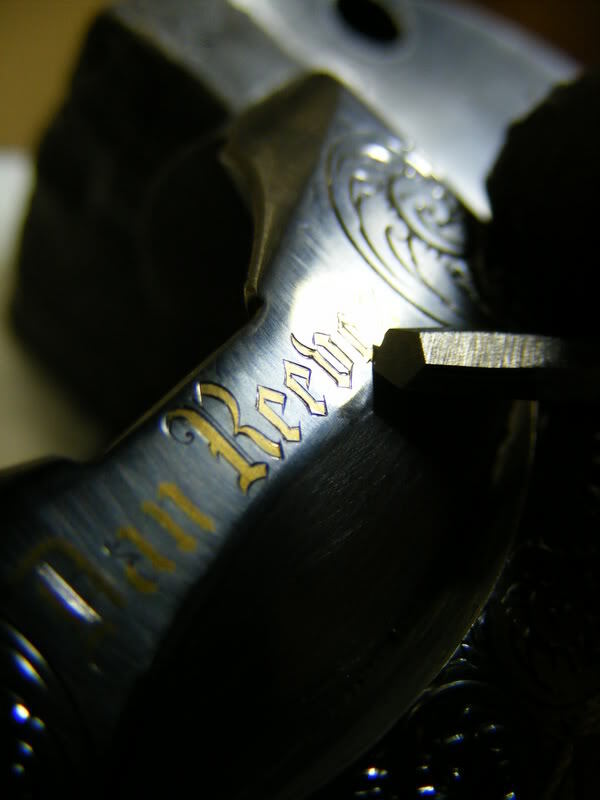 I use the traditional undercut to do sheet inlays. When I do large layout I often use an elipse template to put on the first half of the scroll, then I draw in the rest giving the clean, then rough,layout lines you noticed. The main advantadge to this template method is quick layout with all the scrolls on the Gun on the same scale, which is very hard to do freehand. There are exceptions of course, but I very rarely draw in the leaves, I find it gives the work a dull, cold and mechanical feel. I prefer to cut freehand, which allows me to do my "gestalt" in the moment creativity with the layout. It is, after all, Art, and it should feel easy and almost effortless when things are going well. The piece is almost complete, all the small bits and the frame are finished, I am just going over a few small areas. For me, laying it out in a time-line form was most informative.